Every Japanese garden features elements like stone and granite that are refering directly to nature. In bigger stroll gardens and the Japanese landscape garden we often find a rumbling stream or a koi pond. To connect the shores or to cross streams the Japanese use stone or graniete bridges. The stone bridges are usually very simple slightly curved granite slabs but we also may find rich decorated bridges with bamboo patterns and images carved into the granite. 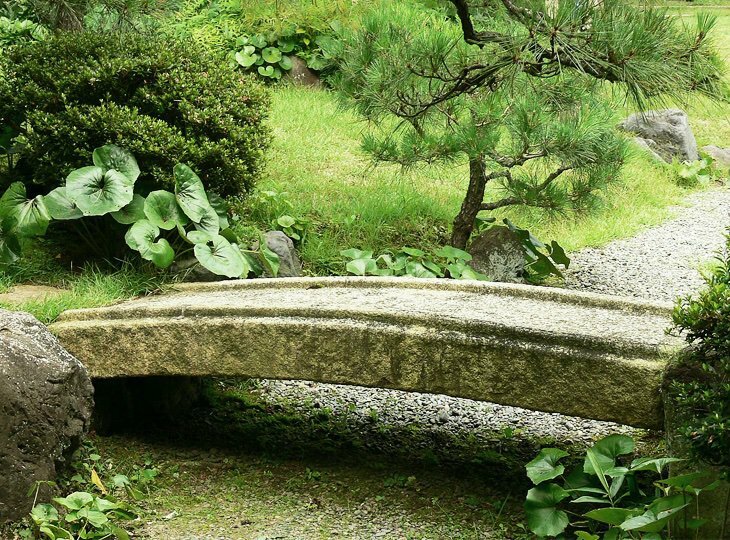 Yokoso Japanese Gardens selected a range of simple and decorated stone bridges for you to choose from. Ancient stone bridges and elements combined with mosses in various vivid color combinations. Time leaves its marks on the lanterns, bridges and ornaments in the aged Japanese garden. In case you are looking for a bigger bridge to cross wide streams or canals then please take a look at the Yuugiri and Asamoya range. These wooden bridges are a perfect solution for bigger projects. All wooden bridges are available in various standard sizes but can also be build to order. Please be advised Yokoso Japanese Gardens can also assist in the search for, purchase or lease of authentic antique Japanese stone bridges and granite ornaments for you. Products that you won't be able to find on our website can, most likely, be ordered. Please use our contact form. Provide a clear description of the desired product and a reference to a picture on the internet and we will try to find the product for you.